After accepting an invitation to participate in the Amarillo Public Library Book Festival during the last weekend in October, I allowed myself a couple of extra days to visit historical sites and museums in northwest Texas and the Panhandle. At the top of my list was a return to the former "Cowboy Capital of the Panhandle," old Tascosa. killed in "The Big Fight"
My first stop was at Tascosa's Boot Hill. There were 10 fatal shootouts in Tascosa during its 1880s heyday, including "The Big Fight," a Saturday night saloon battle on March 21, 1886. Three LS cowboys were killed, along with a fatally curious bystander. These four men were buried on Boot Hill, alongside other gunfight victims, as well as citizens who died of natural causes. The LS Ranch provided gravestones for their three riders, but through the years souvenir hunters chipped away so steadily that in time nothing was left. White metal crosses with black lettering now mark the gravesites atop the hill, and replicas of the three LS tombstones are in place just inside the cemetery gate. The town stood below Boot Hill about half a mile to the northeast and just north of the Canadian River. Great ranches developed in the vicinity, including the LS, the LIT, the Frying Pan, and the three-million-acre XIT. The first Anglo-American structure in the upper Panhandle was a one-room adobe erected by blacksmith Henry Kimball. Soon an adobe general store was built nearby. Assorted other businesses dedicated to serving the ranches and their cowboys were established along a two-block Main Street that ran east and west. The Exchange Hotel was the town's only hostelry, the Tascosa Pioneer became the only newspaper, and the Equity Bar was Tascosa's first - and most famous - saloon. A two-story stone courthouse was built in 1884, after Tascosa became the seat of newly organized Oldham County. The population reached 600, with additional numbers of cowboys and ranchers who regularly rode in from the surrounding countryside to patronize the stores and saloons. LS Ranch headquarters, located about four miles southeast of Tascosa. third LS headquarters and were erected in 1893. A cluster of dives a quarter of a mile east of Main Street was dubbed Hogtown, partially because of the presence of such less than glamorous "sporting women" as Homely Ann, Gizzard Lip, Rowdy Kate, Box Car Jane, Panhandle Nan, Slippery Sue, Canadian Lily, and Frog Lip Sadie. In 1878, Billy the Kid and four other fugitives from New Mexico's Lincoln County War arrived with 150 stolen horses, enjoying Tascosa's bawdy pleasures for several weeks. During the 1880s there was so much rustling in the area that Pat Garrett was hired to lead a band of "Home Rangers." The West's most famous cowboy strike headquartered at Tascosa in 1883. Heavy rains flooded the Canadian River in 1893. The river's wagon bridge was swept away, and 17 buildings were destroyed when their flat roofs caved in. Soon, merely a handful of the remaining structures were occupied, and Tascosa slumped into permanent decline. In 1915, the new town of Vega wrested away the seat of county government. But 1939 marked an unexpected rebirth for the one-time cattle town. Philanthropist Cal Farley organized a Boys Ranch for unfortunate youths, and from a modest beginning the institution now boasts a complex of modern buildings atop the former townsite. A Girls Ranch has been added, and the population now exceeds that of Tascosa during its frontier heyday. All that remains from the 19th century are the courthouse, the one-room frame school, and Boot Hill, last home of the pioneers who lived, fought, and died in the Cowboy Capital of the Panhandle. On October 19-20-21, East Texas Baptist University experienced a noteworthy Homecoming Weekend. For three days ETBU celebrated the 100th anniversary of its founding as a Baptist institution of higher learning. In 1912 the College of Marshall received a charter as a two-year college, as well as a secondary academy. Through the efforts of a few determined men, land was acquired and five buildings were erected. Classes opened in 1917, and the campus stayed busy with debating societies and varsity sports. The 1920 football team won all of their games and never allowed a score. while an auditorium and stage filled the top floor. ﻿ Finances always were tight, in part because most students were on some type of scholarship - one semester there were only five "full pay" students. But presidential leadership was strong, underpaid faculty members were intensely loyal, and philanthropic individuals provided generous support. In 1944 four-year status was attained as East Texas Baptist College, and 40 years later there was another elevation, to East Texas Baptist University. parking lot for the Centennial Gala Celebration. In 2009 I was commissioned by ETBU to put together a centennial history of the institution. I was afforded every cooperation: there were illuminating interviews from alumni who went back to the College of Marshall, veteran professors and coaches, board members and administrators. I was granted access to a wealth of archival material, and staff member Lindsay Culbertson provided invaluable assistance. Inherit the Dream: A Centennial Celebration of The College of Marshall, East Texas Baptist College, and East Texas Baptist University was published by ETBU earlier this year. On Friday of the Centennial weekend, alums were welcomed back to the campus, and Distinguished Alumni awards were presented by ETBU President Stephen "Dub" Oliver. That night students and alumni enjoyed a pep rally and bonfire. At 11:30 Saturday morning there was a float-filled parade through the campus, and at one o'clock the ETBU Tigers took on the Yellow Jackets of Howard Payne University, one Baptist school against another. (ETBU won, 52-28.) On Friday evening a "Centennial Gala Celebration" was staged for alumni beneath an enormous tent which covered an entire parking lot. A "more student-oriented" celebration took place on the intramural field. The evening was capped off with a fireworks display. On Sunday morning at nine, a "Homecoming Worship Service" was held at the chapel. My wife Karon and I were on campus Saturday. It was a splendid fall day and the campus - resplendent with new buildings and handsome landscaping - has never looked better. Alums were everywhere, many of them snapping photos. I signed copies of Inherit the Dream at Books and Java in the Marshall Mall. Owner-manager Linda Jones has secured exclusive rights to the book in Marshall, except for the ETBU bookstore. Bill, holding a copy of Inherit the Dream with Linda Jones at Books and Java. ETBU is poised to carry the Texas tradition of denominational colleges into a second century. The first college in Texas was Rutersville College, a Methodist school in Fayette County. Over 50 private colleges, mostly denominational, operated in Texas (sometimes briefly) before the first publicly funded college (Texas A&M) opened in 1876. Two years later Sam Houston Normal for Teachers began operations, and the University of Texas opened its doors in 1883. Several more state teachers colleges were founded late in the 19th and early in the 20th century. But during this same time period other private, denominational colleges were founded, and one of them was the College of Marshall in 1912. Today, as ETBU, the school is loved by alumni and led by a youthful, dynamic president. Dr. Dub Oliver likes to point out four laurel trees that stand like sentinels in front of the 1917 Administrative Building on the ETBU hilltop. "It is a space that speaks clearly of who we are, where we have been, and where we are going." During my two-year appointment as State Historian I intend to visit historical sites and events in all five corners of the Lone Star State, along with as much in between as I can reach. I've already visited El Paso, as well as several sites on the way west, and at the end of the month I'll be in the Panhandle. But on Friday, October 12, I was in the northeast corner of Texas, where I toured the museums and historical architecture of Texarkana. There is a local system of four museums, along with other museums which are privately operated. Three of the city's museums are under the direction of curator Jamie Simmons. The Museum of Regional History is housed in the city's oldest brick building, a commercial structure built in 1879, then expanded on later occasions. A visitor first encounters an interactive music exhibit featuring Texarkana native son Scott Joplin, the gifted "Father of Ragtime Music," along with Huddie "Leadbelly" Ledbetter, Conlon Nancarrow, and other regional musicians. Other galleries display Caddo pottery, area agriculture and industry, legendary Congressman Wright Patman, and other regional subjects. Jamie and Beverly proudly showed me the third floor, a rich archival collection that has much to offer scholars. Perot Theatre is a noted performing arts center. Across the street is the Discovery Place, a children's museum that is frequently visited by elementary classes and day care groups, as well as by families. There is a new display of prehistoric animals, along with a living science lab and interactive exhibits on electricity and motion and the body. An irresistible attraction for adults as well as children is a 12-foot sound wall, a unique system of multi-shaped panels which produce musical sounds when stroked by the palm of the hand. and his teacher, Lana Camp. A few blocks away Melissa Nesbitt, curator of the Ace of Clubs House, welcomed me to a magnificent Italianate Victorian residence. According to legend, in 1885 Texarkana lumberman James Draughorn drew the ace of clubs in a poker game and won a fortune. Deciding to erect an ornate family home, he chose a floorplan in the shape of an ace of clubs. Tours are given on Saturdays, and on other days tours may be made by appointment. The house and grounds also may be rented as an unforgettable setting for weddings, receptions, lawn parties, or meetings. beside the front steps of the Ace of Clubs House. shoes from Neiman Marcus in her suite. The fourth city museum is on the Arkansas side of Texarkana. The Ahearn House was built in 1905, next door to the spacious home of Mrs. Ahearn's sister, which also still stands. The Ahearns had six children, three boys and three girls. Upstairs Mr. and Mrs. Ahearn had a large suite on one side of a long hall. On the other side the boys had a large bedroom in front, while the girls had a smaller bedroom in the rear. In between these two rooms was a large bathroom and a bedroom for the live-in "nurse," or nanny. Downstairs the music room was unusually large - to accommodate the family's two baby grand pianos. A few blocks away, also on the Arkansas side, is the Fours States Auto Museum, operated by Paul Taylor and other antique auto enthusiasts. Most of the vintage automobiles are on loan to the museum. Currently the oldest car is a 1914 Studebaker in vintage condition. A quaint 1925 Chevrolet one-ton truck was used in the same peach orchard for 80 years, until 2005! acquisition by the Texarkana museum system. Dr. Beverly Rowe, and board member Sam Johnson. New York City's famous Flatiron Building. Back on the Texas side I visited the Lindsey Railroad Museum, operated by Beverly Rowe in one of her downtown buildings. Jeff Lindsey provides railcar storage from all 50 states and Mexico. Because of his interest in the railroad industry, Jeff and his wife Becky provided a substantial grant to Beverly. The Lindsey Railroad Museum already is attractive to railroad buffs, and plans are in motion for an even grander museum experience. Beverly intends to create an "1890s Old Broad Street Exhibit," and she is working to launch "Texarkana's Police & Fire Museum." Elsewhere around town are numerous commercial, residential, and church buildings that will delight those interested in historical architecture. Many of these structures are unoccupied and in disrepair, but remain all the more worthy of inspection. Historic architecture is our most tangible reminder of the past, and Texarkana offers an architectural feast to the history-minded. The oldest courthouse in Texas that still is used as the seat of county government stands with antebellum grace in Linden. The stately appearance of this venerable building has been enhanced by a $4.4 million grant presented in 2008 by the Texas Historical Commission. The 1861 structure was rededicated in February 2012, although interior work still is in progress, and joins the list of restored historical courthouses in Texas. Restored Cass County courthouse. Note the CSA monument. Cass County was organized in 1846 with Jefferson, a thriving port city, as county seat. In 1852 the seat of county government was moved to a more central location, the small community of Linden, while Jefferson resumed its county seat role when Marion County was created from Cass County in 1860. A two-story frame structure was built on Linden's courthouse square. Texas was the fastest-growing state in the Union during the 1850s. The population nearly tripled, from 212,592 in 1850 to 604,215 in 1860. Infrastructure of the frontier state was primitive in 1850, but there was an infusion of $17,750,000 in federal funds ($10,000,000 from the Compromise of 1850, and $7,750,000 to settle damage claims from the War with Mexico), paid in annual installments during the decade. In Austin a State Capitol and the Governor's Mansion were built, along with a State Insane Asylum. Roads and bridges were improved. And funds allotted to each county produced the first substantial courthouses, usually two-story brick structures. The vault was installed in 1888. In 1859 Cass County sold the frame courthouse, which was moved. Construction began on a two-story Greek Revival courthouse with a hipped roof and a small cupola in the center of the roof. The principal building material was bricks fired near Linden. The courthouse was completed in 1861 at a cost of $9,877. The building was enlarged in 1900, but in 1908 a tornado swept away the cupola and inflicted other damage. In 1917 the courthouse was expanded again and redesigned. A third story was added to the east and west wings. In 1933 a fire caused considerable damage. During the subsequent reconstruction the third story was extended across the center. An addition to the west side added space for the building's first elevator. The recent multi-million dollar renovation removed some of the additions and restored the appearance as much to the 1930s as to the 1860s. But the structure remains the only antebellum courthouse still standing. By the time the new Cass County courthouse opened in Linden, Civil War had erupted. At Linden Company I of the Fifteenth Texas Cavalry was organized, and in February 1862 Cullen Montgomery Baker - a notorious desperado - enlisted in the troop. At the age of four in 1839 Cullen had moved with his family from Tennessee to the Republic of Texas, and his father received a land grant in Cass County. Cullen grew up to be quarrelsome and hard drinking, and in 1854 he killed his first man. By the time the Civil War began, Cullen had murdered another victim. At Jefferson in November 1861 Baker joined Company G of Morgan's Regimental Cavalry, but he deserted a few months later. Soon he joined Company I of the Fifteenth in Linden, but in August 1863, he returned home, pleading illness. In February 1863, one year after his enlistment, Baker was discharged due to disability. Baker then rode with a gang of guerilla bandits. Baker's young wife died in 1860. He remarried in 1862, but his second wife died four years later. Within two months he proposed to her 16-year-old sister - and was stiffly rebuffed by her parents. Perhaps depressed by his martial losses, Baker resumed his career as an outlaw. He pumped four slugs into a Cass County merchant to whom he owed money. Baker and his men killed at least two Freedman's Bureau agents, as well as several freed slaves. North of Linden Baker held up a government supply wagon. Rewards were posted and there were pursuits by citizens and by Reconstruction soldiers. Baker was wounded twice during altercations, and his gang disbanded in December 1868. The gang had operated frequently in Arkansas, but soon Baker returned to Cass County. On January 6, 1869, Baker and a companion were killed by citizens at Bloomburg, a rural community near the Arkansas border. On Baker's corpse were found a shotgun, four revolvers, three derringers, and six pocketknives. The two bodies were taken to an army camp at Jefferson and placed on public display. 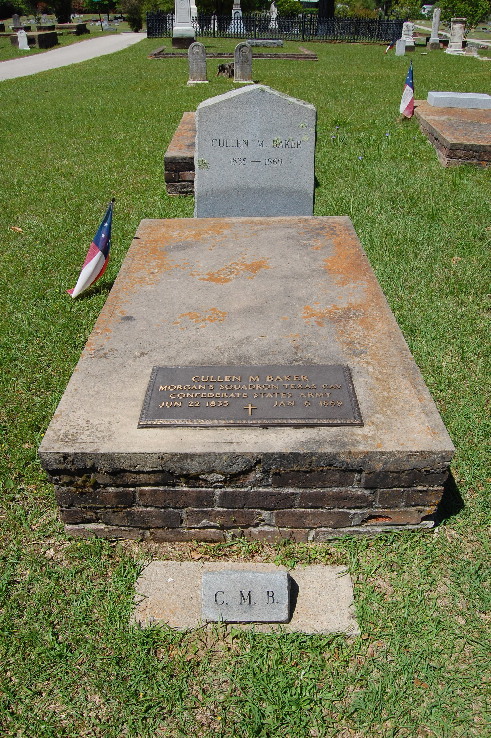 Baker was buried at Jefferson's Oakwood Cemetery. This year marks the 75th anniversary of the worst school tragedy in American history. New London was a rural East Texas community which experienced notable growth after the nearby discovery of the fabled East Texas Oil Field in 1930. The field was 42 miles north to south, and from four to eight miles wide. More than 200 square miles, it was the largest oil field in the world, and every inch oozed black gold. By 1939 there were 25,000 oil wells across the field. The little frame school that had served New London suddenly became inadequate. But funding was no problem, and a large, handsome brick school was erected. New London High School accommodated students in grades five through eleven. A brick elementary school on a hill to the north housed grades one through four. There was a gymnasium, and the New London Wildcats played football in the first lighted stadium in the state. The message from Adolf Hitler is displayed at the London Museum. But a broken pipe allowed an accumulation of natural gas beneath the high school. A few minutes before school was scheduled to end on Thursday, March 18, 1937, a spark from a machine in the shop classroom in the basement set off a massive explosion. The school was reduced to rubble, and more than 300 students and teachers died. It was a staggering tragedy which drew worldwide attention - the London Museum displays a sympathy message in German from Adolf Hitler. The cenotaph stands majestically on SH 24. The London Museum and Tea Room is located opposite the two-story high school that was built to replace the destroyed building. Between the museum and the high school, on an island that divides State Highway 24, is a 30-foot-tall cenotaph. By definition a cenotaph is "a monument or empty tomb honoring a dead person whose body is somewhere else." New Londoners formed a memorial association a week after the explosion and issued an appeal for money. More than $21,000 was collected, much of it in nickels and dimes and quarters. Completed in 1939, the cenotaph was built of 250 tons of pink granite. Two impressive columns are crowned by a sculptured block of a dozen figures representing the students and teachers who were killed. Pink granite steps lead to a stone platform bordered by a 20-inch curb on which names of the victims are carved. A nearby stone records the names of those who later were confirmed among the dead. The London Museum long has been housed in a 1938 frame building that was part of the little commercial district. The structure was a drug store with a soda fountain. There is a handsome new facade, and the building has been expanded to house an excellent collection of artifacts and photographs, as well as a fine model of the destroyed school. A wonderful feature of the museum is the availability of a delicious lunch - hamburgers, sandwiches, fountain drinks, and homemade pies. of victims are listed grade by grade . Four miles east of New London is Pleasant Hill Cemetery, where the greatest number of victims - more than 100 - were interred. A few miles to the south, on a hill overlooking State Highway 64, is a complex of brick school buildings that housed another oil-rich school district, centered around the rural community of Joinerville. Facing south along the hilltop were an elementary school, a cafeteria, an assembly hall, a junior high, and a big, two-story high school. A football stadium and a gymnasium were behind, to the north, and a large home economics building stood in front. The Gaston High School Red Devils sported fine uniforms, and so did the marching band. School the day of the explosion. Teachers College, Dr. William T. Jack, was a 1938 graduate of Gaston High School, and he wrote a nostalgic book about GHS. Dr. Jack recalled that the New London school explosion rattled the windows at the Gaston schools. In 1965 the Gaston and New London school districts consolidated into the the new West Rusk ISD. Two separate elementary schools were maintained; West Rusk Jr. High was housed at old Gaston High School; and the West Rusk High School headquartered in the former New London High building. As the Joinerville community declined, all classes eventually moved to New London, and the old Gaston campus was purchased by a church group. But a Gaston Museum was organized, quite fittingly, in an old snack shop that had hosted generations of GHS students just west of the campus. 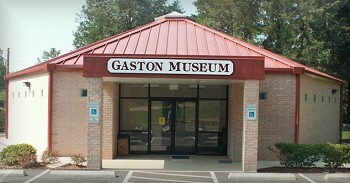 In recent years the Gaston Museum moved to a nearby brick museum structure that was built through the generosity of former Red Devils and other philanthropic citizens. The London Museum and the Gaston Museum offer complementary display collections. And for the history-minded, the former New London and Gaston campuses feature the best 1930s public school architecture. For more information about New London or Gaston high schools, see www.newlondonschool.org or www.gastonmuseum.org . I spent Monday, October 1, in Lufkin as the subject of a "Literary Event" staged by Dickie Dixon. Dickie is the proprietor of 11 antique malls, three located in his native Lufkin. He is an energetic promoter, and one of his favorite promotions is a Literary Event - a book signing in one of his stores, followed by a "Banquet" at which the author delivers a program about his or her book, concluded by another signing. Dickie explained to me that any books that are not sold at the event are divided up among his 11 stores, probably just two or three per store. Book-signing display at Antique Mall. In Lufkin on Friday, September 29, Dickie staged a Literary Event featuring Heather Green Wooten and her excellent book, The Polio Years in Texas, published by Texas A&M Press in 2009. The following Monday he brought me to Lufkin with my 2010 book published by the University of North Texas Press, The Johnson-Sims Feud: Romeo and Juliet, West Texas Style. This book describes the last blood feud in Texas, a West Texas struggle between two prominent ranching families. The comparison with Shakespeare's famous tragedy, Romeo and Juliet, and the Johnson and Sims families make this book especially appropriate for a "Literary Event." The first customer who came to buy a book was a former student of mine at Panola College during the early 1990s, Trey Reeves. I had a delightful reunion with Trey, who decided to stay for the banquet at Manhattan Fine Dining. The restaurant was excellent, and I thoroughly enjoyed presenting a program on this last frontier-style blood feud in Texas - a West Texas soap opera! The next morning I was at the large Region VII Education Service Center in Kilgore to greet more than 80 Texas history teachers from the area, and again I had the pleasure of seeing several former students. The Texas State Historical Association sponsored the day-long workshop, which was organized and conducted by Steven Cure, TSHA Director of Educational Services, and by JoNeita Kelly, Adult Education Program Coordinator of the TSHA. This Texas History Workshop stressed content rather than teaching techniques. Steve and JoNeita assembled a large number of experts who offered an impressive variety of topics during breakout sessions throughout the day. The 4th and 7th grade teachers were able to choose from a veritable buffet of delicious Texas history subjects. I was invited to deliver a keynote address to the entire group at the beginning of the day. The topic was the Regulator-Moderator War in East Texas, the first blood feud in Texas and the deadliest in American history. This conflict was a landmark event in the history of extralegal violence in the United States, and participants embodied the endurance and tenacity and sheer physical courage displayed by Texans of the nineteenth century and beyond. Yet this significant and colorful topic is virtually ignored by modern textbooks, so that information about it should be shared with teachers. During the next few years the TSHA will offer similar subject-oriented workshops in other regions of the state.